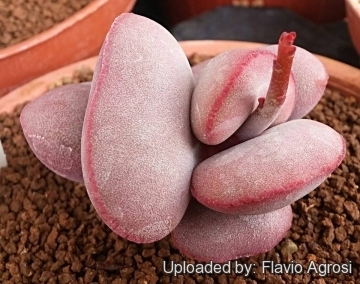 Origin and Habitat: Adromischus marianiae var. hallii grows within 30 km of the coast of the northern Richtersveld (West Bushmanland), Republic of South Africa, and in south-western Namibia. 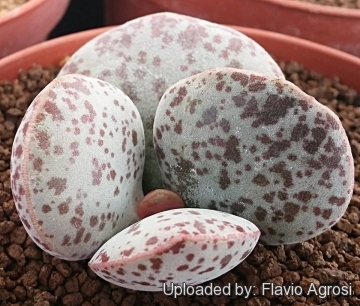 Description: Adromischus marianiae var. hallii is a rare plant from the South African/Namibian border, it has the broadest, thickest leaves within the Adromischus marianiae complex. Leaves are shorter, more rounded, chalky, grey-green either red spotted or plain. It is a dwarf to low-growing species, stays small and compact with tuberous roots and thick stems. Leaves: Broadly obovate to circular, 1.5 - 2.5 cm long, greyish-white to reddish green, occasionally spotted, lamina smooth, dorsiventrally flattened to globose. Marginal ridge raised, horny in the upper half and usually undulate. 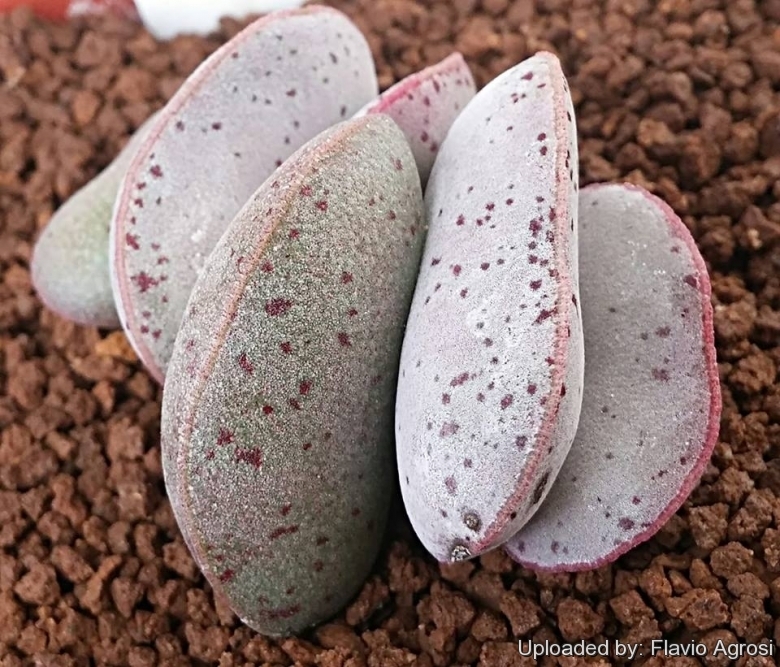 Adromischus geyeri Hutchison: has terete, chalky, mottled reddish-brown, grey-green leaves with a rounded tip. The horny margin is often not visible at the tip. Distribution: South Namibia. Diamond Area No.1. Adromischus marianae (Marloth) A.Berger: (var. marianiae) has grey to reddish darker markings along the leaves. It has the longest margin along the top edge of each leaf of any other variety. Distribution: Cederberg around Clanwilliam. Adromischus marianae f. alveolatus (Hutchison) Pilbeam: similar to f. herrei but with leaves which are shorter less acute, generally more robust, and with a very rough surface. Distribution: north of Concordia. Adromischus marianae var. antidorcatum (Poelln.) Pilbeam: has a a rough leaf surface similar to A. marianiae "immaculatus". Includes forms with short leaves. it is very variable. Distribution: Namaqualand, West. & South Bushmanland. Adromischus marianae var. hallii (Hutchison) Toelken: has the broadest, thickest leaves within the A. marianiae complex. Leaves are chalky, grey-green but red spotted forms have been found. Distribution: South Namibia, North & West Bushmanland. Adromischus marianae f. herrei (W.F.Barker) Pilbeam: has the roughest leaves and can resemble dried raisins! It is a small plant, characterised by petiolate leaves, thin stems and thin inflorescences. Distribution: Namaqualand coastal mountains. Adromischus marianae var. immaculatus Uitewaal: has cylindrical leaves, but with great variation in marking and texture. It usually has slighly rough leaves. Distribution: South Namaqualand, Knersvlakte. Adromischus marianae var. kubusensis (Uitewaal) Toelken: Very variable in leaf shape: the plain, grey-green leaves vary from long-cylindrical to short-fat. Distribution: Richtersveld mountains. Adromischus marianae cv. Little Spheroid: has superb and very peculiar round leaves. Distribution: Namaqualand, Northern Cape, South Africa.